This book was an amazing read, and I was blessed by the gods to be able to read it! 🙂 In fact, when I was reading it, I kept forgetting that the author was close in age to the main character, Laura Thomas. Miss McKinnon’s grasp of the English language is well beyond her years, and her acute attention to all the right details, combined to whisk me back to the trials and bittersweet joys of my own youth. The story is told through the eyes of one fourteen-year-old Laura Thomas. Through her, we meet her older brother Aeric, her best friends Amy and later Kayleigh, and her parents. Laura is carefree and loves to take photographs, especially in Liverpool. Her best friend since she was five is Amy, and they’ve literally grown up together… and now that they are fourteen and sixteen, BOYS have come into the picture and all Amy can seem to think about are boys, boys, BOYS! Laura doesn’t really want to be left out, but her focus (when it comes to the male form) seems to be on the svelte form of one Daniel Craig! In fact, her brother Aeric would agree with her… well, until it comes to taking the train to Liverpool to get coffee from a certain coffee shop! I have always loved books that don’t have a set beginning, middle and end, but rather a continuance of perspective. I don’t want a ‘Dear Diary’ style of book, but I love it when it seemsalmost stream of consciousness, and this book gave me EVERYTHING I wanted. Miss McKinnon’s writing was engaging, and in my opinion, it was the picture of perfection for a coming of age story. It had just the right amount of funny, just the right amount of message, and the right amount of lead in to what love is and can be. 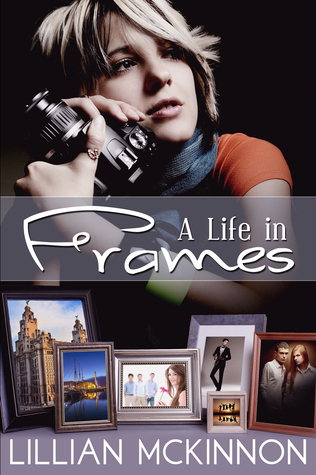 FRAMES explored the entire spectrum of what friendship is to a teenager, how delicate its strong web is, yet how easily they can be broken and just what it can take to fix it. Laura always seeks to do well, to be a good friend, a good sister to Aeric, and a good person. She’s someone I could aspire to be, were I a teenager in today’s world. And there are so many more! Suffice it to say that once this book hits the press, this reader will be buying a copy! Since it is listed as Frames #1, I know that I am in for many years filled with the Thomas children and their beautiful families!